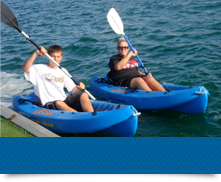 Stand Up Paddle Board Rentals, Lessons and more. Most park patrons think stand up paddle boarding is a new water sport, but it’s actually an ancient form of surfing with an Hawaiian heritage. Beginners can become comfortable in the first hour. 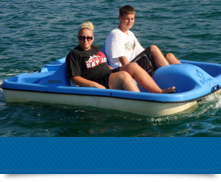 Using a long paddle and standing up you can just cruise along. It can be a meditative experience on a calm day. 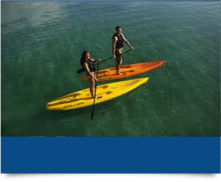 Both Paddle Boards and Kayaks can offer a good upper body workout as well as cardiovascular conditioning. First timers will enjoy the challenge of balance. The built-in deck grip provides maximum traction. The benefit of a good workout is an unexpected bonus. It is faster and easier to learn than it looks. Join in on the fun of this new growing sport. Come down and try it — it’s really easy and fun! Affordably priced at just $20 per hour in 1/2 hour increments. All paddle board rental passengers must know how to swim, wear the provided personal floating device (PFD Life Jacket provided) at all times while on the water, be at least 18 years of age, or be accompanied by a parent or legal guardian who must supervise the minor at all times both on land and while on the water. California Windsurfing’s personnel must hold a valid US Drivers License, or Passport as security until all watercraft and associated equipment has been returned and accepted by a California Windsurfing representative. SUP Rentals are on a first come first services basis weather permitting. Contact California Windsurfing today for hours of operation, availability and weather conditions. Comprehensive all inclusive program for beginners 12 years of age and above. Group size 3 to 5 students, $65 per student. Please call for time and availability. Private Lessons: One-on-One personal instruction $95 weekdays only. Semi-Private: 2 students only, $75 per student weekdays only. All classes are by appointment only and weather permitting. Sorry, No checks or credit cards or $100 bills can be accepted at our waterside location. 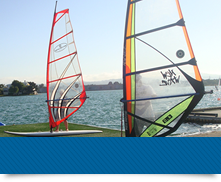 To keep our rates as low as possible California Windsurfing has elected to remain a cash only facility. We know this can be inconvenient. However, Our customer survey indicated that lower rates are highly preferred over convenience credit card acceptance. Students/Renters of Windsurfers, Kayaks and Stand Up Paddle Boards must must be 18 years of age, or accompanied by a parent or legal guardian, know how to swim, complete and sign California Windsurfing’s waiver agreement, acknowledge they understand and agree to be bound by its terms and conditions. 12:30pm to Sunset Tuesday through Friday. 11:30am to Sunset Saturday & Sunday. Right on the waters edge directly behind the Vibe.